Finally after a few weeks of having the air conditioner installed and awning put on, we brought home our new toy, the Mighty Lite 12' Camping Trailer. So excited! I am really happy it's just a tiny guy. Going camping with just the minimal will be awesome, esp when it's time to unpack after the trip and for towing should be easier as well. Now a week later after the previous paragraph, we got the trailer home safely and have started putting our stamp on the little trailer, trying to get rid of some of the ugly brown in there. Every trailer always seems to have the ugly brown interior. I would love to have had a Vintage Small Trailer, they are so darn cute, but after remodeling this house the last thing I wanted was to remodel a trailer. I just want to have fun now this year. We've planed a cruise to Alaska and some camping trips. Last year was moving and remodeling all year long, this year I hope to just kick back and relax and so far that is pretty much what we've been doing. We went shopping today for things for the trailer. We stocked it up and our now redecorating it the best we can. Here is a photo of Steve's first back up into the driveway at our house. My pillow on the couch, even with that ugly brown geometric design, the pillow makes this couch look pretty sweet. But not for long! soon I am covering the top back cushion to this fabric below. I made this pillow especially for the trailer. Isn't it adorable. I got the pattern at the Shabby Fabrics. Isn't this fabric sweet, I mean precious! we are in love with it. I can't wait to get it, just ordered it today and I will cover the back of the couch pillow with this fabric. 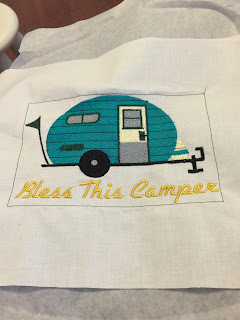 Finding this fabric was a great find, it will go nicely with the little camper my cousin Katherine made for me with her embroidery sewing machine. It's so adorable. I am going to quilt around it a mini quilt to hang on the door in the trailer. This is the fabric in all the seats of the trailer, not to shabby, I think I will keep it, it's soft are pretty. See those boxes over the windows, the fabric has to go, so we recovered them this weekend. I had a ton of fabric in my fabric stash, so I pulled out some and this is what we came up with. Cute, cute, cute, see the newly covered window boxes? it's a bit of a mess in the trailer we are getting organized. Well I got the bathroom fully decorated and ready. Inside the shower/tub I put all the showering supplies into a caddy, so that is where it will be stored. There is a handle in the caddy, I just pick it up and in it I put shampoo, soap, toothpaste and so on, there are little sections in the caddy, I will have to show that off next time I do an update, it's a really neat and handy thing to put in your trailer in your tiny bathroom. We would have gotten all the trailer set up today but it was over 100 degrees here. It was to hot to work in the trailer today. Yesterday we did the recovering of the window boxes and I put a lot of stuff in the trailer. We will be going camping in a few weeks, so excited! I bet it is fun to have it home and putting your own special touches on it, looks great, love your pillow and the fun fabric you picked out for the cushions. That was so sweet of your cousin to make that for you, perfect for you new place!